PRNewswire: OmniVision announced the OV16850, a 16MP imager for smartphones. Using an 1.12um pixel and leveraging OmniVision's stacked die technology, the PureCel-S OV16850 captures stills and video in native 16:9 aspect ratio. "16-megapixel sensors represent another milestone in the 'megapixel race' for higher resolution cameras in smartphones. 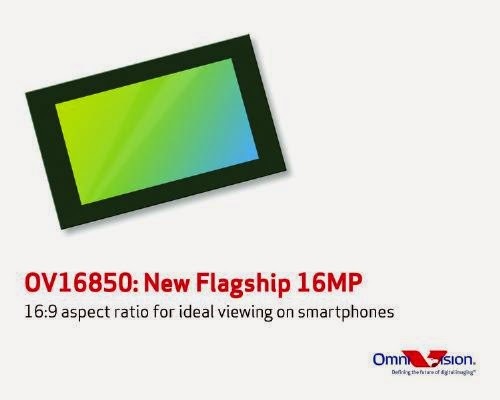 Coming in a native high definition 16:9 aspect ratio, the OV16850 is designed with the smartphone camera user's experience in mind," said Bahman Hadji, product marketing manager at OmniVision. "As smartphone OEMs increase display resolutions to 1080p Full HD (FHD) and 1440p Quad HD (QHD), the OV16850 offers a camera experience matching these display aspect ratios and filling the smartphone screen without any loss in field-of-view for snapshots and video. It also utilizes OmniVision's stacked die technology and a high chief ray angle to enable a 16-megapixel camera solution in a compact 9.5 mm x 9.5 mm x 5.5 mm module." The 1/2.6-inch OV16850 is capable of capturing full-resolution 16MP images at 30fps, 4K2K video at 30fps, QHD video at 60fps, and 720p video at 120fps. It is said to deliver the best-in-class sensitivity, SNR, and full-well capacity for a 1.12um pixel. Additionally, the OV16850 features alternate-row HDR mode. The sensor is currently sampling and is expected to enter volume production in Q1 2015. Hello! Please, somebody knows how to interpret the pixel saturation signal given in "mV"? Is there a standard electronic amplifier to convert electrons in voltage for all sensors made by Sony and Omnivision? One needs a conversion gain figure to convert them into electrons. There is no "standard electronic amplifier," sorry.